Hiking and camping are great ways to relax, get some fresh air, and enjoy the Great Outdoors even if we don’t always have the same amenities as at home. This makes certain tasks difficult or quite polluting. By using a biodegradable toilet paper we can definitely make a difference in at least one regard. If you never went camping before, you most likely never heard of this type of toilet tissue until now either. It is possible that even some seasoned campers, backpackers, and hikers have yet to learn about the existence of such a product. This is the right place to learn more about this eco-friendly tissue, including some products you can buy today. We strive to give you a piece of information that is as accurate as possible, that you can hopefully put to good use one way or another. You don’t even need to spent the night in the forest to start being more eco-friendly, because you can do so at home too. Before discovering the items best suitable for camping use, you might want to learn a thing or two about this kind of product. Keep in mind that an absolute best toilet tissue for hiking has yet to be invented, and you must compare your preferences to the product’s features to decide which one to get. The first difference you’ll notice is the price, then color, and then scent. All Green products are more expensive, but they’re really worth it if they damage Mother Nature less than the standard items. Upon opening a pack, you’ll this type of tissue is thinner too. Speaking of packaging, you’ll notice that generally there are 4 rolls in one, and sometimes only 2. The number of sheets per roll depends from brand to brand, and you should try make sure you have plenty – it is better to have more than not having enough. You could be a lifesaver for those running out of toilet paper. The general home use toilet tissue is made of tree fiber, is often colorful and perfumed to attract buyers. Some of those elements also irritate your skin. The eco-friendly paper may be made of cotton, bamboo, and other fibers, while being white and odorless – hence safe for your skin. It is rare for manufacturers to list exactly what the roll of paper contains. The rolls made of recycled materials will be advertised as such. This is the type of tissue I prefer using, for I feel it protects the environment more. How does the biodegradable tissue work? This type of paper is designed to break apart much faster when in contact with water: its thinness and “ingredients” sure help the process a lot. There is a simple test you can do at home: place a few sheets of toilet paper in a jar filled with water. The paper should completely disappear in maximum 24 hours, for it to be labeled as biodegradable. No matter the type of toilet paper you use, its disintegration time will depend on several factors. These include the type of climate you’re in, paper thickness, number of layers you use, and its components. The shortest time is a few seconds after being in contact with water. This paper is generally designed for marine and RV use, but it is generally ideal for any outdoor activities. If your house uses a septic system, or your pipes clog a bit too often, be certain a product like this will make a difference. Some professional plumbers will recommend its use at home as well to prevent clogging. Aside from the obvious purpose, you can also use this product to wipe your hands, tears, or even instead of a handkerchief. Some people like to cover the ground with it, before sitting. Just like with any other type of paper, make sure this one doesn’t get wet. Should this happen, even by accident, you risk being left with no toilet tissue and this can be a problem at times. The best way t store such a paper is by placing it in a waterproof container or plastic bag with a zipper. There are very few people who prefer a rough toilet paper, but this one is actually soft. There are some types that are made of recycled fibers, and even those ones are softer than expected. Being soft means you will help your skin stay clear of rashes during the adventures. Why not use regular paper? Generally yes, and there are several reasons for it. For starters, if it is scented it will release some bad chemicals into the ecosystem around and it can even attract bears. Colorful toilet tissue might not bring the bears at the table, but it will still cause considerable damage. Because it will also take longer to dissolve, it carries the risk of spilling into some water and polluting it. Lastly, but not least, it is a bit ironic to bring it camping since it was made from trees that could have been around you. The only way to reduce its impact in that situation is to pack it and throw it away as garbage after use. To review the items below, we didn’t only take a look at their features, but also at their weaker points, in order to deliver the most informative review you can ask for. 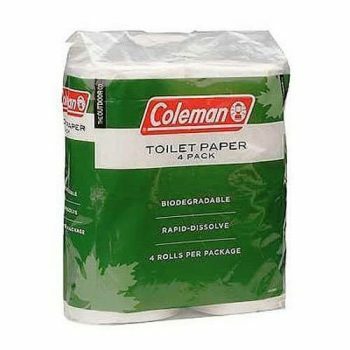 Those who purchased the Coleman Camp Toilet Paper seem to have split opinions about it. They generally agree on one thing though: it does what it is supposed to do. Given that this is a biodegradable product, it is at least safe to use out in the nature, if not in the RV’s toilet. Some folks complained that this item doesn’t dissolve in water as it should, and they deemed it not safe for the RV toilet. The really unpleasant part is that the rolls are not coreless, therefore you can’t really hang them on any branch when using the bushes instead of a proper toilet. Those worried about having too many chemicals touching their skin, especially the most sensitive areas, have nothing to worry about. This product doesn’t contain neither dyes or perfumes. The only colors you can see are on the package. Make sure to keep the product away from water, just like you would with any other type of paper tissue. Related: If you’re not comfortable with relieving yourself just about anywhere, a hygienic toilet kit could be something to consider for your next adventure. You can check out the Cleanwaste Toilet Bags, to get you started. Some products are better than others for a camping adventure. 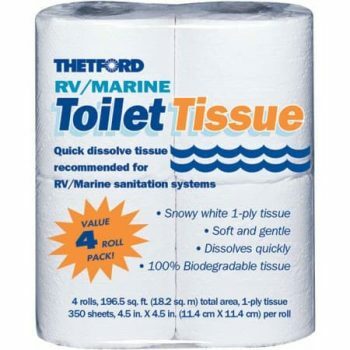 The Thetford Toilet Tissue is one of them because it is specially designed for marine and RV use. Don’t be scared to purchase this product because it is as white as it gets and it is also very soft and pleasant to the touch. It is also very absorbent, which could mean you’ll need a few extra layers than what you’re used to. If your camping conditions don’t include a proper toilet, you should bring this toilet tissue with you because it is biodegradable, unlike regular home toilet paper. Speaking of your home, if you might want to switch to this product if you notice often pipe clogging. This tissue dissolves really fast in contact with water, minimizing the occurrence. With 350 sheets on a roll and four rolls in a pack, this item seems a really good choice to bring along on a weekend getaway. If you’re using more paper than that, then you will feel this product is a waste of money, and something else will be a better choice for you. Related: If you go RV-camping, you might have noticed that at times the holding tank can become quite smelly. You can easily purchase the Natural Rapport Tank Treatment to prevent this from happening, from now on. For some people the Stansport Toilet Tissue is a little overpriced. This must have something to do with the number of sheets per roll – 99. Others have more sheets, as you can see even from the other chosen products. This particular product might be more convenient for those spending just a weekend in an outdoors setting and would rather return with as little luggage as possible. Buying this toilet tissue will make your life easier as you won’t experience any rashes or irritations. The risk of this happening while using leaves is very high. This paper is biodegradable and soft to the touch, your impact on the surroundings will be minimal while your skin will feel great. Even though it is single ply, it is resistant enough as not to break immediately. What’s more is that despite its thinness, it is highly absorbent. The size of one sheet is large enough to allow you to use it for other purposes as well, such as a napkin or paper tissue. Many people have an issue with the number of sheets per roll with this item, but it can prove to be enough for just two people for a couple of days. Related: If you’re going to use a public toilet, you’ll definitely not feel comfortable sitting directly on it. The Toilet Seat Cover is a convenient product you can use to cover the toilet so that you can be safe and comfortable. Not all toilet papers are the same, and some are simply better because they’re made from recycled fibers. 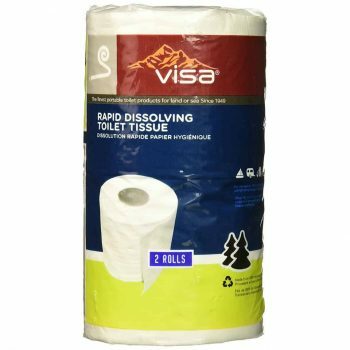 While not everyone is a fan of using this type of paper for it feels dirty and coarse, this Visa Dissolving Toilet Tissue is here to prove you wrong. Its color is white and not gray like with most other recycled papers. To achieve a white tissue, bleaching must be used. In this case, the process involves using other methods and substances, other than chlorine. This left a softer sheet of paper that will not irritate your skin. 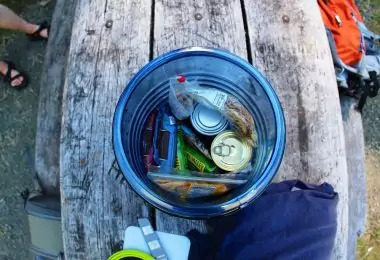 The only downside is that depending on how long you will be camping, you might have to buy more packs, as there are 2 rolls in a pack, though the number of sheets might allow you to use it as paper towel as well. You can use this toilet tissue anywhere you go especially if you’re worried about your impact on the surrounding nature. This product is biodegradable in addition to dissolving fast in contact with water. These are important features to notice because most modern papers are not like this. Related: When camping or even hiking, dispensing of certain things can be a very unpleasant issue. The Grizzly Peak Trowel is sure to make certain tasks easier and more environmentally friendly. Everyone wants to use soft and absorbent toilet paper, even on the road. This particular item might be just what you hoped for, especially if you want it to dissolve up to four times faster than other similar products. Being a single ply kind of paper must be the factor improving the dissolving speed. In fact, simple contact with water will make it break apart, so you must keep it dry at all times. 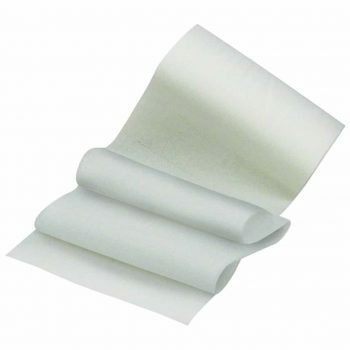 The sheet is thick enough to give the impression of a 2 ply paper, however you might want to fold it several times as not to have it breaking during use. 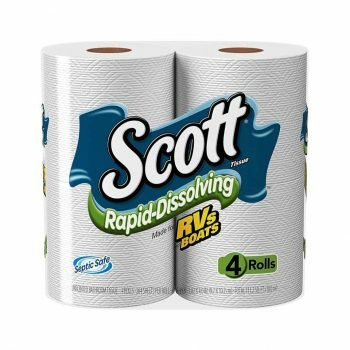 This Scott Bath Tissue is really good in places with older piping systems or where the septic system clogs often. If your skin is more sensitive and you worry this product will irritate you, then you have nothing to worry about: it just won’t happen. Related: There is one thing campers don’t want to deal with, but do so anyways: bad toilet odors. If you want to avoid this very unpleasant situation, you could give the Happy Camper Odor Neutralizer a try. While we reached the last product on our short list, we hope you learned something new and useful. Regardless of the type of toilet paper you will choose to use, maybe you can at least try one of the products we presented here. Be sure that if you take it along while camping, you’ll make an impression on those joining you on your expedition, and it will be a positive one. Do you have any other preferred toilet tissue we didn’t mention here or did you use any of the selected products? We’d love to hear from you, so please use the comment section to share your thoughts!